I try stuff. Take tonight for instance. I’m trying astrophotography using nothing more than my camera. Digital imagery has made earthbound telescopes much more powerful and useful and even allows bare cameras to act as telescopes. The final product is a single photo of the nighttime sky. 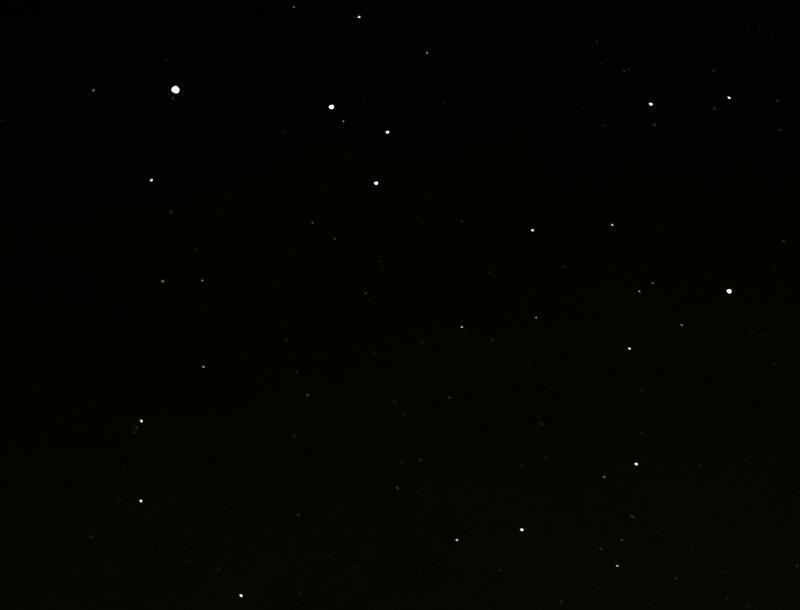 The final product is a single photo of the nighttime sky. Getting there requires 92 photos plus 72 more that are either totally black or totally white. Those last 72 are important! The Earth is turning. That enters into the shutter speed. Open too long and your photo has streaks of light as the stars move across the sky. My goal is stars that are single points of light. The shutter stays open 13 seconds. It is steadied on a tripod. The shots are tripped electronically by an intervalometer. I take shot-after-shot-after-shot each for 13 seconds. As I said, the Earth is turning. Stars shift slightly in each shot. The photos are run through a program, DeepSkyStacker, to realign them. DSS also looks at those black and white frames to see where the camera adds its own noise, which is subtracted. Result–cleaner image. The instructions, written years ago, talks about going to sleep while the results are calculated. Now it doesn’t take an hour. It is the most computationally taxing program I run–by far! I’m disappointed by the result. I thought I’d try this once and drop it. Guess not. Don’t be disappointed! Getting nice, tight, round star points is not easy! What you need, is a good star chart to show you where to point the camera. There are programs out there that will also de-rotate your pics if you take longer exposure ones. Registax is very good, but a little steep on the learning curve. DeepSkyStacker does basically the same job, but can handle the RAW images my camera natively produces. I should have shot with my 30mm lens at f/1.4 which would have produced a lot more light.